Ririne's Miniatures: Great material for miniature knitting! Great material for miniature knitting! as I entered the lovely shop... The price was a bit more than what I would have wanted to spend but the colours were so awesome, I could not resist... This is what the kit looks like. Here is my first attempt at a sweater. Little Trixie loves her new sweather, she is all cozy and she will be more than ready for nice walks during Fall. Here is another dog shirt I made, isn't it adorable?! I love fall and so does my dogs! Your dogs are so exquisitely made! I love their body language -- the expressiveness is truly amazing. I am awestruck by how much life you've embodied in such tiny handmade creatures! Thank you so much! 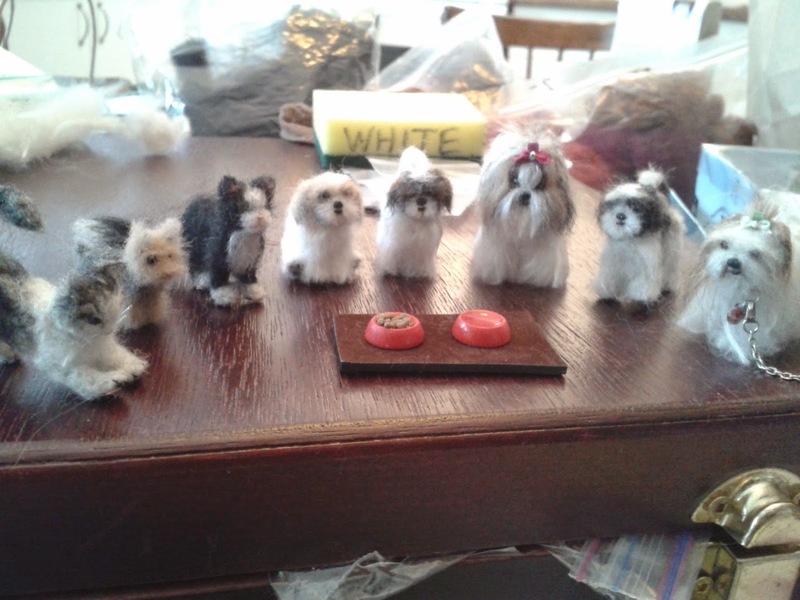 I am very happy you like my tiny felted friends! The fun part about them is that they can take any position that you like, therefore you create their personality by posing them. I will be working on new breeds soon, I would like to do huskies, golden retrievers, kittens and cavalier spaniels ect. so you can expect to see more. I am glad you like my work and thank you for the lovely comment. !